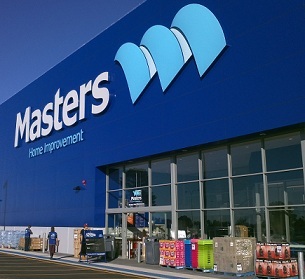 After a somewhat slow start, Masters continues to expand with stores now open in Joondalup and Ellenbrook, and one under construction in Bayswater.They're well worth a visit for a variety of household and garden needs. Masters Home Improvement has arrived in Perth and local hardware and white goods retailers may be in for a challenge. I first heard of Masters in the business news. 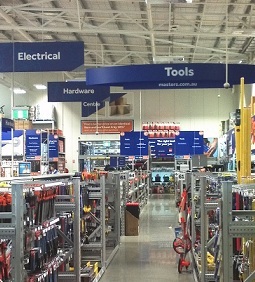 Woolworths had formed a joint venture with US hardware chain Lowes to offer a new option for DIY enthusiasts, and - not coincidentally - challenge Bunnings market share. Since it often seems that these things happen only in the eastern states, I forgot about it until a friend mentioned one was opening nearby. I decided to investigate and am glad that I did. First I checked their website and was very pleased to find that a raised garden bed which I had previously had to order online was in stock locally and $10 cheaper. Further research revealed that as of June 2012 Masters is the first company on Australia to offer nationwide online hardware shopping. They also offer a "click then collect" option meaning you can order online and pick it up at your local store later the same day (depending on the time ordered). Masters currently has two stores open in WA with a third planned for August. 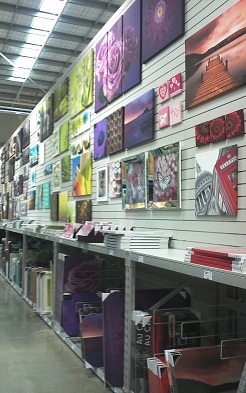 At the time of my visit, the Bibra Lake store had been open for three weeks. There's plenty of parking and the store is huge, bright and clean with high ceilings and plenty of light. On arrival a greeter gives you the latest catalogue and a map. I opted to explore and spent the next hour wandering though products from adhesives to work benches and finding quite a few surprises along the way. For example, sections devoted to lighting and wall art, some great flat pack storage furniture, a flooring selection that includes carpet (and installation), white goods, wallpaper, and did I mention hardware, plumbing and electrical? I finally left with my two garden beds, a wall heater and a few other bits and pieces…but I'll be back. Prices at Masters are good but what won me over was the variety. They had products I've never seen in Perth before (like my garden beds) and they offer a great range of services: delivery, assembly, installation, design advice and more. There were plenty of staff on the floor and they were all very helpful. Last but not least, the sausage sizzle out the front was spot on – a nicely charred snag with lots of onions served up by a community group. Check it out. I've been to the Masters at Bibra Lake and they do have just about everything - it's brilliant. Great selection of products and great prices too. Yes, one is opening closer to me soon and I forsee many visits.